Writing may be a solitary experience, but it’s important to your success as a writer that, at some point, you connect with your readers. 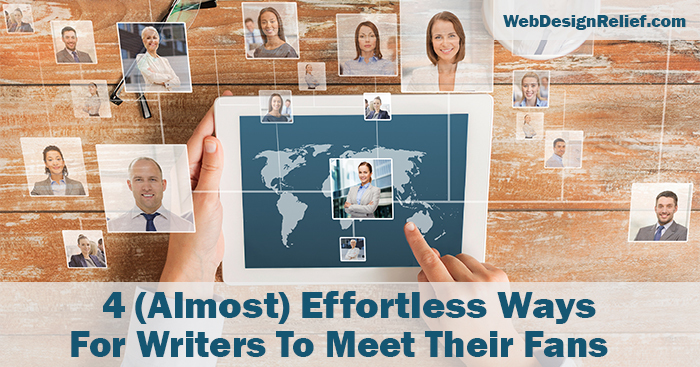 While it’s always nice to meet your fans in person at readings, book signings, or conferences, the Internet experts at Web Design Relief know it’s easier than ever to interact with your readers online. And best of all, with just a few clicks, you can answer questions, talk about your writing, and schmooze—all while sitting in your favorite chair and wearing your fuzzy slippers! Create A Facebook Group. If we’ve said it once, we’ve said it a thousand times: Social media is vital for promoting yourself and your writing. By creating a Facebook group dedicated to you and your writing, you provide a forum for fans who want to talk about your work and follow your progress. A Group can be open (visible to everyone) or private (visible to members only). For ideas, check out the Stephen King: Constant Reader Fan Club or Midnight, Texas Fans, dedicated to novels written by Charlaine Harris. Hold A Live Streaming Event. You can also host live streaming chats on Facebook and interact with your fans in real time. And it’s easier than you might think—you can even use your cell phone camera! Your followers will receive a notification of when you’re going live so they can tune in and meet you “in person.” It’s a great way to announce the cover art selection for your new book, the publication of your latest poetry or short story in a literary journal, or your upcoming book signing or presentation. Open A Book Club On Goodreads. Goodreads is the original online mecca for book nerds: Forums, yearly reading trackers, and book clubs galore can be found in this corner of the Internet. You can create a fan club to discuss your favorite books—including your own! Take a look at Emma Watson’s Our Shared Shelf or author Colleen Houck’s Book Club for ideas. Be sure to link your author website and social media to your book club page so that new fans can follow all your online author platforms. Start A Group Chat On Twitter. You can also create a group on Twitter that will allow you to Direct Message the group and have conversations with members. It’s a great way to develop a stronger relationship with your readers and to quickly and easily share updates about your writing. Groups can be public or private—but who wouldn’t want to belong to a secret fan club? QUESTION: What online forums or groups do you belong to? Tell us in the comment section!